INKin' All Night! : Pizza and Soda Pop Anyone? 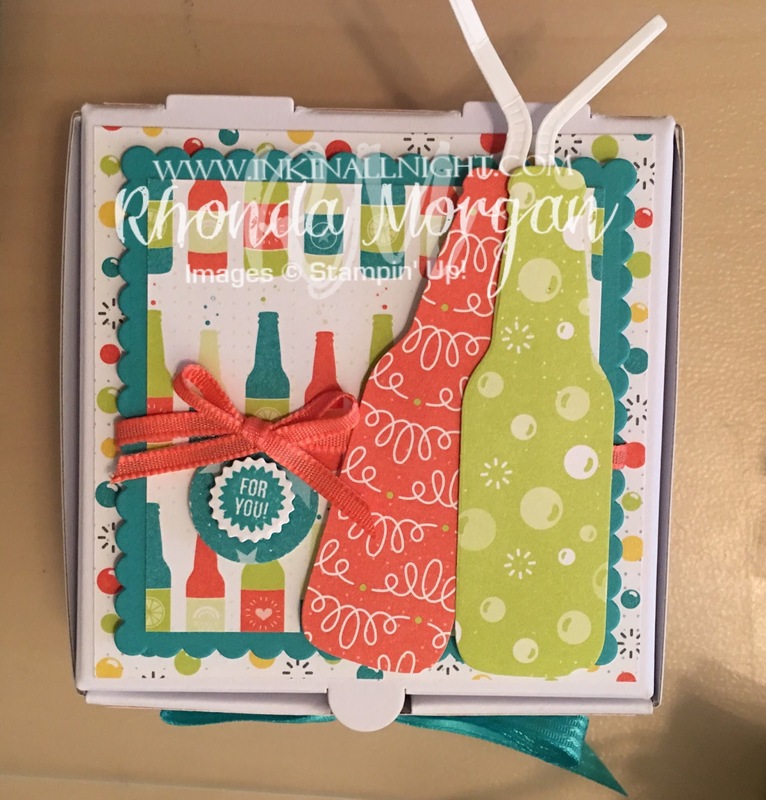 I thought I would share with you today the cute little Pizza Box and Soda Pop treat box I made! When I first saw the stamp set, I knew right off I'd be making a trip to our big Sweets Shop Candy store in the Phoenix, valley area. Do you remember eating these as a kid? Yes, I did try one as an adult and hmmm, not so sure I could call this a favorite anymore! But I will leave my childhood memories alone and choose to remember them as yummy, along with the wax lips and Halloween fangs!! 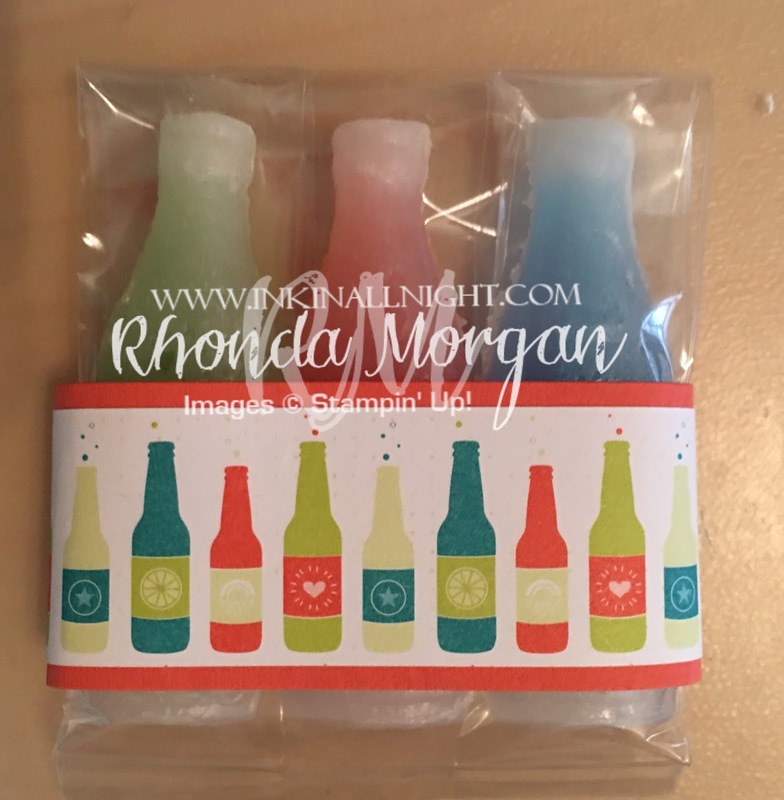 These cute little Mini Pizza Boxes come in packages of 8 for $6 and they are the perfect size for giving gifts, 3'x3" Notecards and envelopes (pkg of 40, $9) and of course treats! I packaged a few of the wax bottles in one of our 3'x6' gusset cello bag (pkg of 25, $4.50). Just fold it over, secure with some washi tape, and then wrap a little strip of cardstock and designer series paper around it to secure with a belly band! Simple and Easy! 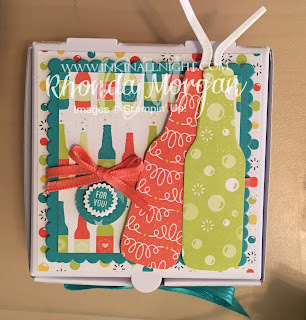 For the Mini Pizza Box I chose to feature the DSP and cut strips to decorate the side edges of the box, layers for the top along with cutting out a couple bottle shapes from the fun DSP patterns too, added a little pop of a For You stamped image and called it ready to go! You can find the Mini Pizza Boxes and Notecards in the Holiday Catalog section and the Gusset Cello Bags in the Annual Catalog. Thanks for stopping by and shopping with me if I can assist with any of your stamping needs & wants! Stamp Set and DSP - coming soon in the Occasions Catalog & SAB Brochure! Check back for more of my On Stage, Bubble Over Bundle display samples! This is adorable! I can't wait for this cute paper to come out (or for me to pre-order...lol) so clever to put the wax "soda" bottles in. Guess I need to go to the dollar stores, seems I've seen them there. Thank you Rhonda for sharing! Love them! Thank You Donna!! I'm glad you like it! I found the candies at the Sweeties Candy Shop in Chandler! In case you don't find them locally to your area of town! hugs!